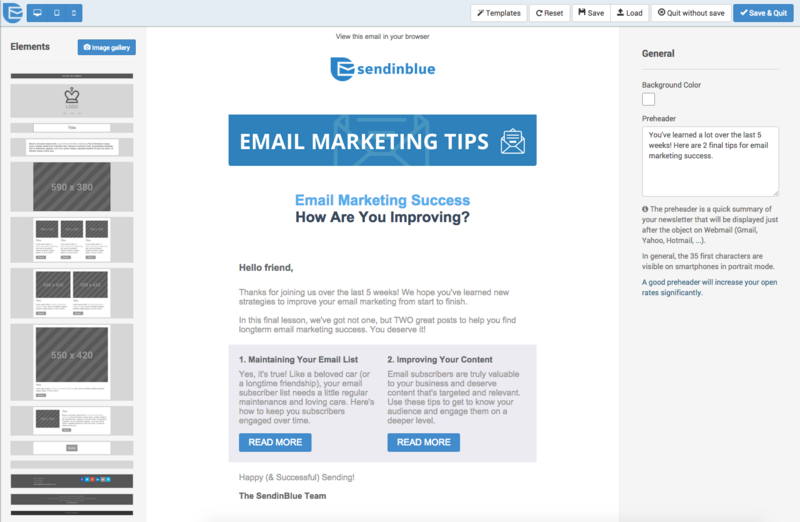 SendinBlue is great for simple email marketing, especially for small businesses. It's very easy to get the account setup and create an email compared to other services like MailChimp. It's also very user-friendly for those who may not be technically savvy. If you have a much larger scale email list or regularly import lists from outside SendinBlue, then you may want to look elsewhere. SendinBlue is great if you stay within the system, but can cause trouble if you import email lists outside of the system. I would really love if there were an input option for adding videos! I just released a music video and it would be so nice if fans could watch the video while reading the rest of the email instead of needing a new browser to be opened. I would love new designs and features for the font and email layout options just to keep it fresh and fun! It would be cool if SendinBlue could also team up with social media for sharing purposes. Often times I can share an Instagram post to Twitter and Facebook in one click. It would be cool if I could send from Instagram to my SenditBlue contacts! SendInBlue was considerably more economic and provided all the features we needed including excellent reporting and analytics. We went from a 30% open rate to a 45% open rate when we switched to SendInBlue. Our click rate improved from 1.5% to 6.5% when we used the templates in SendInBlue.